We’d love your help. Let us know what’s wrong with this preview of How Come? by Kathy Wollard. Fact-filled, fun-filled, as interesting to parents as it is to kids, the How Come? series is the trusted source for lively, clear answers to kids’ science queries. Now the best questions and answers from all three books—How Come? ; How Come? Planet Earth; and How Come? In the Neighborhood—have been revised, updated, freshly illustrated in full color, supplemented with twent Fact-filled, fun-filled, as interesting to parents as it is to kids, the How Come? series is the trusted source for lively, clear answers to kids’ science queries. Now the best questions and answers from all three books—How Come? ; How Come? Planet Earth; and How Come? In the Neighborhood—have been revised, updated, freshly illustrated in full color, supplemented with twenty completely new questions, and combined into one bigger, better volume. How Come? explains, in fascinating detail, more than 200 mysteries and phenomena in the world around us. These are the questions that pique kids’ curiosity—and stump parents. To ask other readers questions about How Come?, please sign up. Be the first to ask a question about How Come? Although it's not likely to ever be my favorite children's science book, it's still really good and filled with lots of information. Easy to read and filled with illustrations, it's sure to answer those random science questions that kids are so good at asking. In general I found it to be a really fun read. 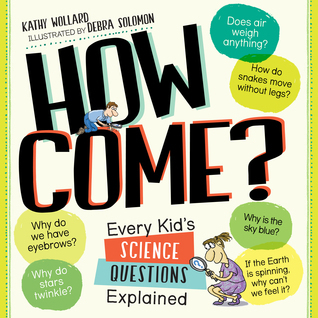 Fun book filled with all the questions (and answers) that kids ask about science. Didn't finish, but definitely a fun read for kids who love science - or frankly for anyone who is curious about the everyday mysteries of science. What a great collection of scientific questions are answered in this book! The questions are divided into groups according to their theme, for example there are sections relating to light and sound, weather, outer space, living things, etc. The questions are answered using correct scientific terminology throughout, some of which would need explaining or further investigation by younger or less scientifically knowledgeable individuals. The book is targeted at older primary (elementary) school pup What a great collection of scientific questions are answered in this book! The questions are divided into groups according to their theme, for example there are sections relating to light and sound, weather, outer space, living things, etc. The questions are answered using correct scientific terminology throughout, some of which would need explaining or further investigation by younger or less scientifically knowledgeable individuals. The book is targeted at older primary (elementary) school pupils and all the way up to adults - there is a wealth of scientific knowledge in it, presented in a relatively easy to understand fashion with brilliant illustrations (including humorous cartoons) to help enhance comprehension. It doesn’t just answer questions, there is other information included as part of the answers, usually shown in a differently coloured ‘box’. Fast Facts appear fairly regularly throughout the book, giving further concise information relating to the questions being answered. There are also ‘Measure for Measure’ boxes on some pages, showing the equivalent measures mentioned in the answer as metric and imperial measures, so it won’t matter if you measure length in feet and inches or metres . . . mass in pounds or kilograms . . . . or any other combination of measures, this book helps by informing you of the equivalent measure. There are even opportunities to ask other questions of your own and maybe have them answered in the “How Come?” newspaper! A very useful book that may well answer questions that some adults would like to ask, too! It could easily be used as a source of information by pupils (and adults) too and some pupils would enjoy reading different sections and finding out the answers, even when not studying! This is a delightful book to read, even if you are well versed in science, because the concepts are expressed so well by the author. Unusually the illustrations are not diagrammatic, but in many cases Debra Soloman’s artwork uses its own special narrative to make the reader think more deeply about the content of the text and draw them into Kathy Wollard’s skilful explanations. This combination makes How Come not only accessible to children in the later primary school (elementary school) grades, b This is a delightful book to read, even if you are well versed in science, because the concepts are expressed so well by the author. Unusually the illustrations are not diagrammatic, but in many cases Debra Soloman’s artwork uses its own special narrative to make the reader think more deeply about the content of the text and draw them into Kathy Wollard’s skilful explanations. This combination makes How Come not only accessible to children in the later primary school (elementary school) grades, but also those beginning secondary school (high school). The language of the explanations is clear and friendly, although there are occasionally more complex words, such as ‘propagating’ and ‘repertoire’. But, as this is not a book that talks down to its readers, words that are not immediately understood can be looked up. The book has a great deal to offer adults. The narrative-style explanations in the book are a potential source of inspiration for science teachers thinking about how to engage their students with science, as well as parents wanting to answer the question ‘why?’. It is a book that can be jointly read and enjoyed by children and their parents, while encouraging discussion. The witty cartoons and How Come’s no nonsense approach mean it could be used as an enjoyable way to take the anxiety out of science learning for adults embarking on a science access programme. Many science concepts do not easily gel with real life because they cannot be touched or seen and are therefore abstract and difficult to grasp. Kathy Wollard merely slips in tangible, real-life analogies to bridge any potential gaps of understanding. The book is a joy to read and something to constantly dip back into. Have you lived through the Why is the grass green? The Sky Blue? Why can't ostriches fly? How do rockets Work? and the million other questions parents and caregivers are asked every day. Now there is a book that can answer those questions for you. Scientific answers are given that encourage those seeking answers to explore and search for the answers. Sometimes beyond the answers from the book. How Come? Every Kid's Science Questions Explained may not answer all their questions and may even incite new ones; but at least it will give you and others looking for answers a place to start. It says it is for kids, but I disagree it can be used by anyone of any age. A 5 out of 5 star rating. The book How Come? Every Kid's Science Questions Explained features a selection of best questions and answers from all three previous books by Kathy Wollard: How Come? ; How Come? Planet Earth; and How Come? In the Neighborhood plus some more; altogether more than 200 answers to science-related questions inquisitive children all over the world ask their parents and teachers. The explanations were revised and updated, they are clear, eas How Come? The explanations were revised and updated, they are clear, easy to understand, accompanied by funny illustrations that make the reading even more enjoyable. The questions are grouped by topic, an index for quick search can be found at the end of the book. This collection of often surprising answers to many typical clever kids´ questions is a great introduction to the fascinating world of science. Over four hundred pages of scientific facts and informational tidbits are compiled into this fascinating book. It covers just about everything you could think of. Curious kids will love having their questions answered. The book dedicates one "chapter" to each question, so you can easily fit one or two in before bed or at dinner time. The writing is engaging, and each question is answered within a couple of pages. There are full color illustrations on almost every page, along with cartoons and jok Over four hundred pages of scientific facts and informational tidbits are compiled into this fascinating book. It covers just about everything you could think of. Curious kids will love having their questions answered. The book dedicates one "chapter" to each question, so you can easily fit one or two in before bed or at dinner time. The writing is engaging, and each question is answered within a couple of pages. There are full color illustrations on almost every page, along with cartoons and jokes. If your child likes science or wants to know everything about everything, then this is an excellent book to get. It would also make a fun family read. Source: The publisher loaned me a digital galley of this book in exchange for an honest review. Jak to możliwe? to wydana w 1993 roku książka zawierająca odpowiedzi na 173 pytania nadesłane przez dzieci z różnych stron świata do redaktorów amerykańskiego dziennika “Newsday”. Przez ponad 20 lat książkę wydano w 11 krajach i kilkakrotnie wznawiano, aby odpowiedzi zawierały informacje zgodne z obecnym stanem wiedzy naukowców. Najnowsze wydanie Jak to możliwe? zawiera najobszerniejsze komentarze wybitnych specjalistów z wielu dziedzin, którzy na ponad 400 stronach wyczerpująco odpowiadają na n Jak to możliwe? to wydana w 1993 roku książka zawierająca odpowiedzi na 173 pytania nadesłane przez dzieci z różnych stron świata do redaktorów amerykańskiego dziennika “Newsday”. Przez ponad 20 lat książkę wydano w 11 krajach i kilkakrotnie wznawiano, aby odpowiedzi zawierały informacje zgodne z obecnym stanem wiedzy naukowców. Najnowsze wydanie Jak to możliwe? zawiera najobszerniejsze komentarze wybitnych specjalistów z wielu dziedzin, którzy na ponad 400 stronach wyczerpująco odpowiadają na najdziwniejsze nawet dziecięce pytania. In kid friendly terms, questions are answered. Pleasing graphics, fast facts, informative cartoons and text boxes help break up the pages. Whoever said science is boring didn't meet Author, Kathy Wollard. She's helped make science fun and fascinating. She answers questions that I'm sure you have asked. Questions like---"Why is Mars red?,How do snowflakes form?,and What causes brain freeze when we eat ice cream?" This is a fun fact filled book with answers to some of life's unique questions. Best science book ever!! I chose to put this book on my science bookshelf because it may provide similar questions that students may have. This book is good for providing answers to questions that maybe I as a teacher would not be able to explain well.